Do You Fall into #MalnutritionTraps? - Triple Joys!!! To address this problem, the government launched the Pinggang Pinoy® campaign in 2014. But, what really is this campaign all about? Pinggang Pinoy® is an easy-to-understand food guide showing proper food group portioning on a per-meal basis which reflects the principles of MOderation, VAriety and BAlance (MOVABA) to promote healthier eating habits. Acknowledging the fact that solving the Philippines’ Double Burden of Malnutrition is not an easy feat, Ajinomoto Philippines Corporation recognizes the need for a collaborative effort between the public and private sectors. 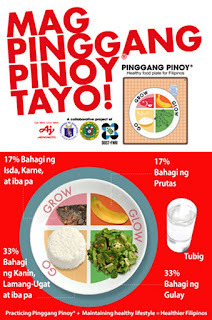 With this, Ajinomoto partnered with government agencies to conduct education programs to raise awareness and promote the practice of Pinggang Pinoy® in malnutrition hotspots, where incidences of Double Burden Malnutrition are high. Trainings were given to homemakers/mothers who have malnourished (underweight, stunting, wasting, overweight and obese) school-aged children. The Ajinomoto Group is a global leader in amino acids thanks to its advanced bioscience and fine chemical technologies. Its products cover a range of fields such as seasonings, processed foods, beverages, amino acids, pharmaceuticals, and chemicals. Since discovering "umami" (the fifth basic taste, created by glutamic acid, a type of amino acid) in 1908, we have been scientifically pursuing the possibilities of amino acids, and supporting the healthy lives of people all around the world. Based on our corporate message “Eat Well, Live Well” we aim for further growth and continuous contribution to greater wellness for people by creating value with communities and society. The Ajinomoto Group has offices in 35 countries and regions, and sells products in more than 130 countries and regions. Its sales were 1.1502 trillion yen (10.3 billion U.S. dollars) in fiscal year 2017. To learn more, visit https://www.ajinomoto.com/.